Ken Greenberg gave a great interview to Civic Action’s Emerging Leaders Network a few days ago with his take on the new thinking that’s needed about how we plan parks and open spaces in our cities. Greenberg is the Principal at Greenberg Consultants and also on the board of Toronto Park People (where I work). He is the former Director of Urban Design and Architecture at the City of Toronto. In the interview, Greenberg speaks about the need to plan parks and open space as networks of different kinds of spaces in order to respond to the challenges of a growing, dynamic city. This is a topic Greenberg has spoken about before in an interview he did with Spacing Magazine back in July. 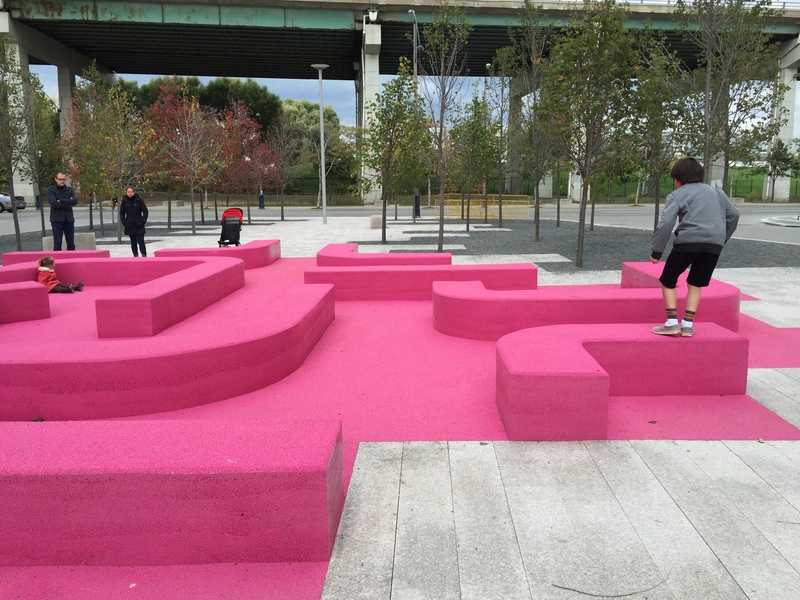 “Very often what’s important is not just the individual spaces, but the networks,” Greenberg says, such as our streets, trails, and other public spaces. Be sure to follow Ken on Twitter. Last week I went to Toronto’s first laneway summit, put on by the Laneway Project, an organization that hopes to start a discussion about the potential of the city’s more than 250 kilometres of laneways to become more people-friendly spaces. Much attention has been paid to cities that are promoting commercial uses, restaurant cafes, and public art in their laneways, like Seattle and Melbourne. 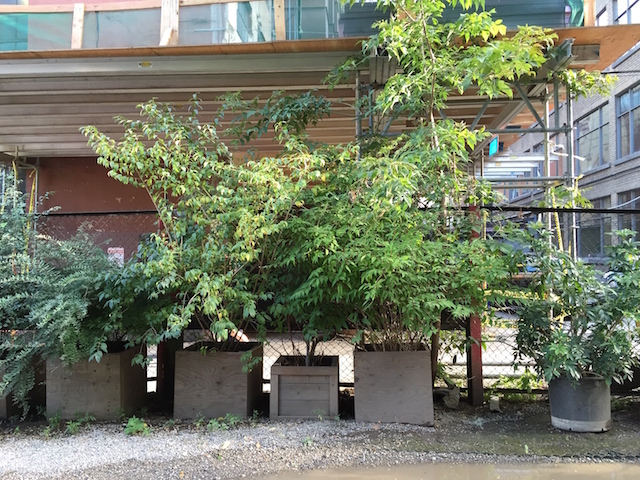 But lately I’ve been doing a lot of digging into how cities are using laneways to create a fine-grained network of linear green spaces that connect existing parks. Spacing Magazine’s Dylan Reid, one of the Laneway Project presenters, wrote a good piece on laneways as shared street spaces and pedestrian connections. 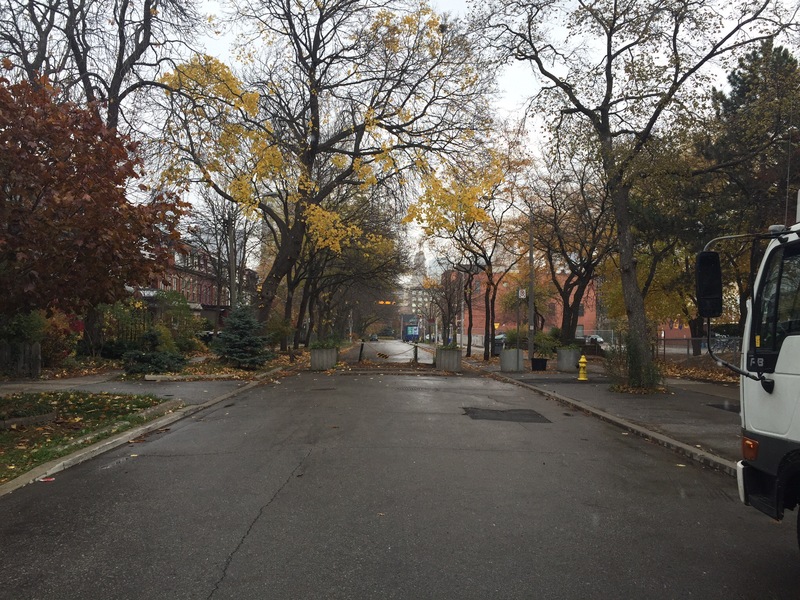 And many cities are looking to capitalize on that potential by including laneways as part of the parks and public realm planning tools in local neighbourhood plans, or through programs or projects specifically designed to look at the potential of laneways as green park-like spaces and connectors. Laneways not only create pleasant, fine-grained, and safe ways to walk or bike to the park, but can help extend the park itself into the neighbourhood and draw your eye to the park from other streets. The key is to prioritize improvements to laneways that can serve that connection function to an existing space. San Francisco’s Market and Octavia Area Plan is a great example of how laneways are being looked at as connections and extensions of parks. 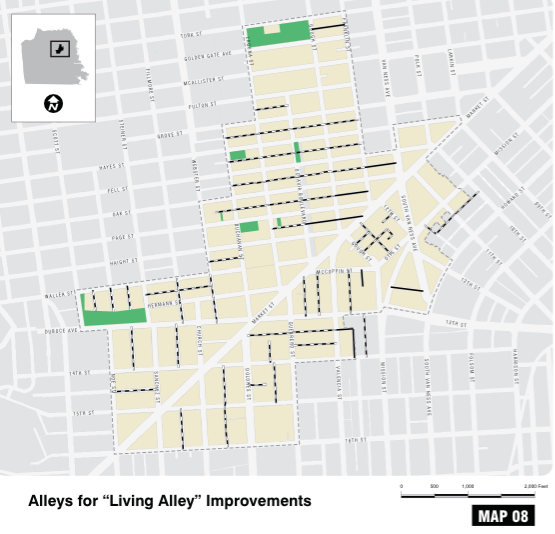 Calling these potential laneways “living alleys,” the plan lays out where the potential improvements could be made. Many end or connect to existing parks, helping to increase open space access in an area the City says needs more neighbourhood-scale parks, but has few opportunities for more. 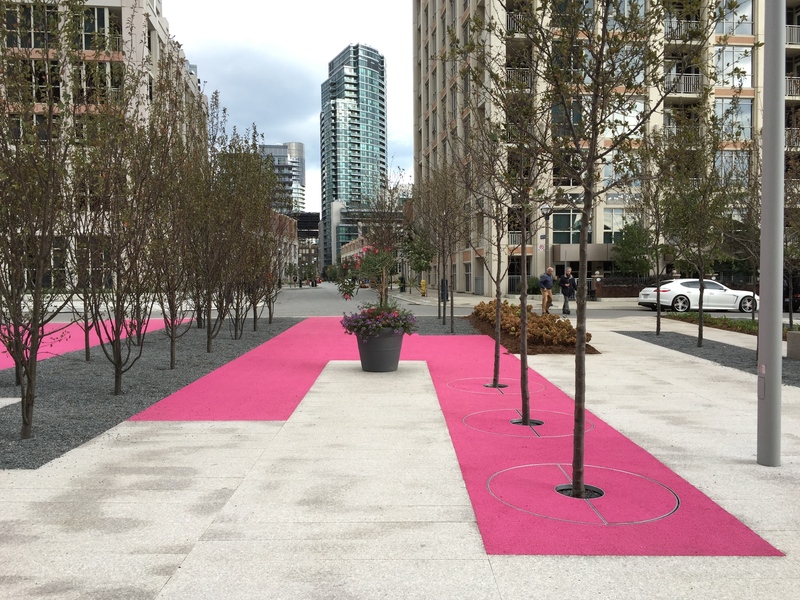 And Los Angeles is also looking to use laneways as park-like connectors to existing parks and schools in neighbourhoods that are low in parkland. Jodi Delaney of the Trust for Public Land, which is working with the City of Los Angeles on the project, told the LA Times the benefits of greening laneways goes beyond just creating more park-like places, but helps to reduce stormwater run-off and the urban heat island effect. We haven’t quite grasped the potential of laneways in Toronto yet, but we are moving, it seems, slowly in the right direction. 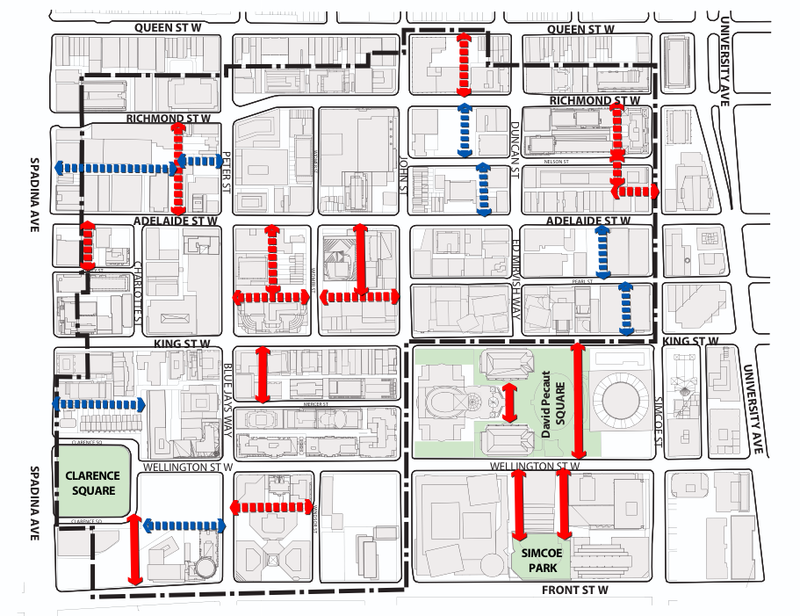 The draft public realm plan for the downtown King-Spadina area (I work right on the edge at Richmond and Spadina) maps out potential and existing mid-block connections. However, it doesn’t include potential greening or park-like improvements as options, which is a shame because this area is, as city staff point out, a high-density neighbourhood low in green space and only growing in population. It’s also home to a lot of workers who just need a place to sit outside and enjoy their lunch or have a short break–something a redesigned laneway could offer. It almost goes without saying, but there are different solutions for different types of laneways. It’s all dependent upon what the local community needs, the function of the laneway for vehicles and servicing, and the width and sunlight available. The Seattle Integrated Alley Handbook is a good resource for how to approach different types of laneways. 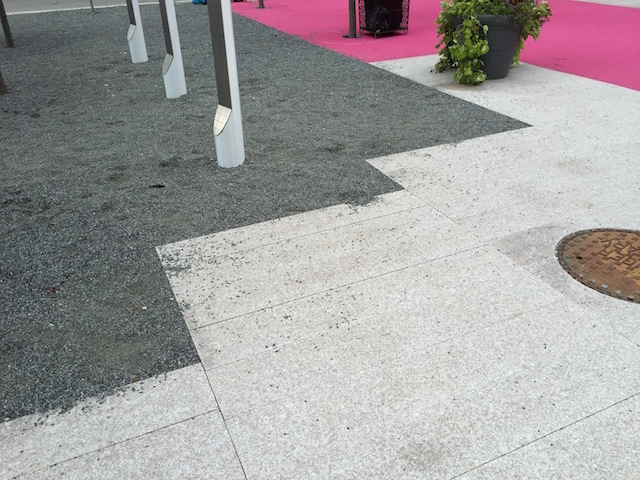 But just adding planters can do a lot for an otherwise dingy, uninviting laneway space. In the laneway behind my office building, a row of planter boxes outside helps to make it much more pleasant. 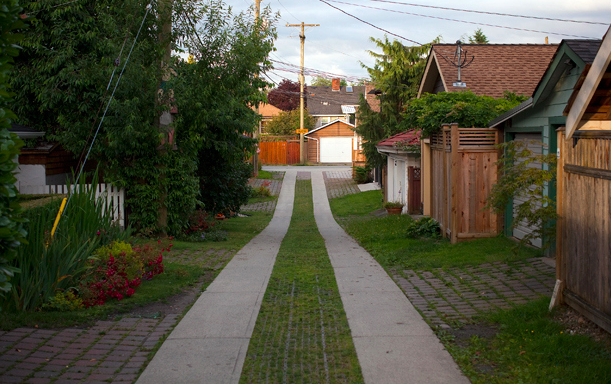 Vancouver’s until recently apparently forgotten Country Lanes pilot project from 2002 saw several laneways introduce permeable surfaces and plantings to create a wonderful back road feel (see title picture). 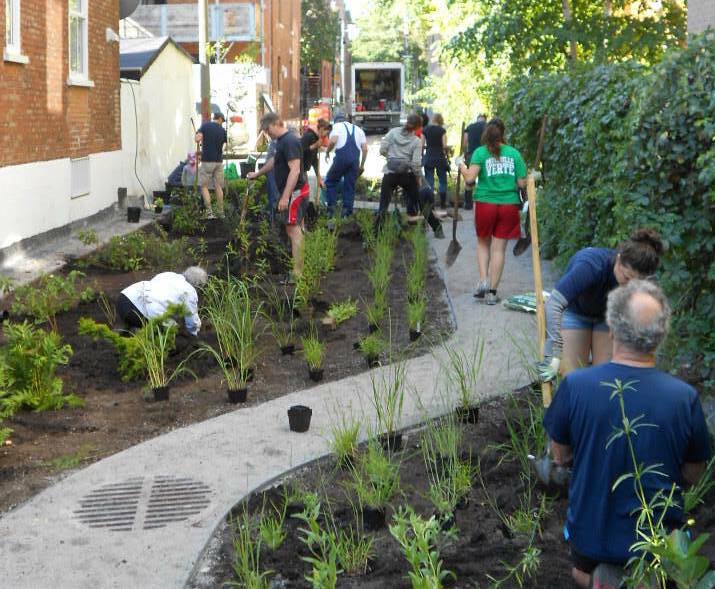 This is a bit like the “Ruelle Verte” program by Montreal’s Eco-quartiers, which partners with residents to improve the feel of their laneway by adding plantings and reducing impermeable surfaces (you can see a map of them here). It’s great to see so many of these project springing up from residents themselves who want to improve the quality of their spaces. But we also need our city planners and government to recognize the potential in these spaces and allow these types of projects to happen through supportive policies and plans. title image from National Post’s Ben Nelms, maps from their respective plans, planter picture my own, and Montreal picture from Eco-quartiers. Want a linear park for your city? Get in line. Up high, at grade, underneath, below ground, around, sideways and longways, it seems that every city everywhere wants to build a linear park. Usually constructed along a piece of active or disused infrastructure like a rail or hydro corridor, these parks help connect communities and provide unique green spaces in locations that may have been viewed as leftover or unusable before. Here are some “line” projects. Did I miss one? The answer is yes. Let me know in the comments and I’ll add it in. If there’s one thing I learned from this exercise it’s that I want very much to live forever in the soft-focus world of architectural renderings where it’s always the golden hour and there is always at least one bird swooping above majestically (seriously every rendering has a bird, except for the underground park). The High Line is a–oh, who am I kidding you already know. The third section of this elevated park opened in September and the whole linear park has sparked billions in private investment nearby. It wasn’t the first project to reuse old infrastructure to create a linear park, but it definitely was the one no one would shut up about afterwards. And for good reason. It’s beautiful and gives you a perspective of New York that is entirely unique. I had the pleasure of seeing Ryan Gravel, the man behind Atlanta’s BeltLine project, speak when here was here in Toronto a few months ago. He made me simultaneously excited about the project and ashamed that my Masters thesis did not spark a multi-million dollar public works project as well. 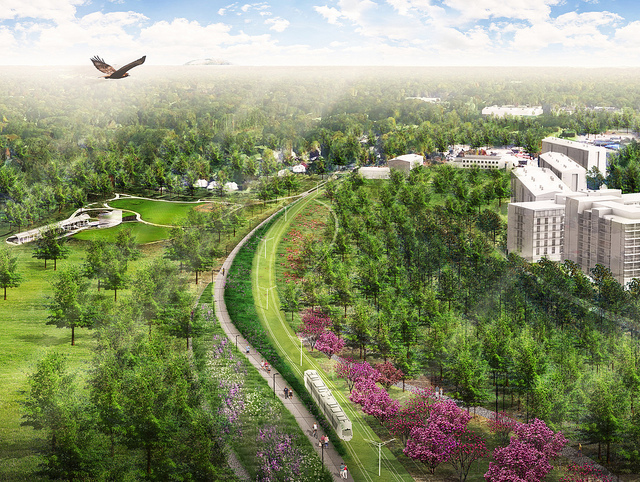 Gravel wrote his thesis on the opportunity of creating a transit line and linear park with trail along a 22-mile loop of rail lines that ring Atlanta. And then he did what almost no one ever does: he turned his Masters thesis into reality. Portions have been built, but this will be a multi-year process and the way that Gravel and the Beltline team have done the ground game to earn community support for this project is inspiring. 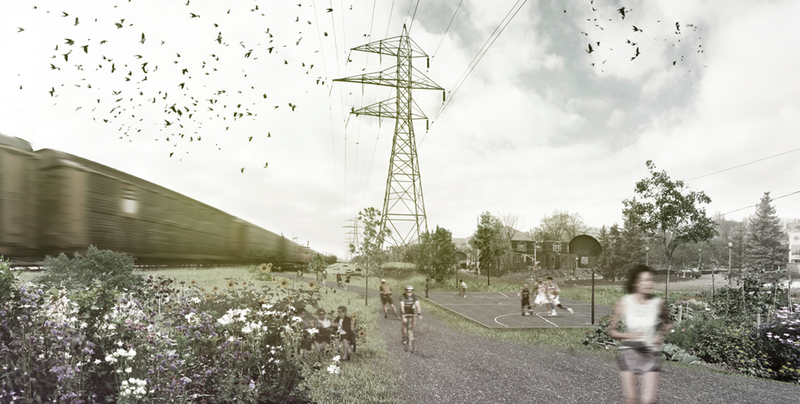 If built, the Green Line would transform a 5km hydro corridor into a linear park. There was an international design competition in the summer of 2012 that helped spark interest in the idea and now the organization I work for, Toronto Park People, has helped form Friends of the Green Line, a group of interested citizens and local residents, to advocate for the project. There are currently nine city parks along the route, but they are disconnected and the route is broken up by roads, grade changes, fences and parking lots. A master plan is needed to pull all the elements together and provide a cohesive vision for the entire route as a connected whole. If built it will run through several city wards and areas that are identified as low in parkland and then end conveniently near my apartment. If you can’t build on it, then build under it. 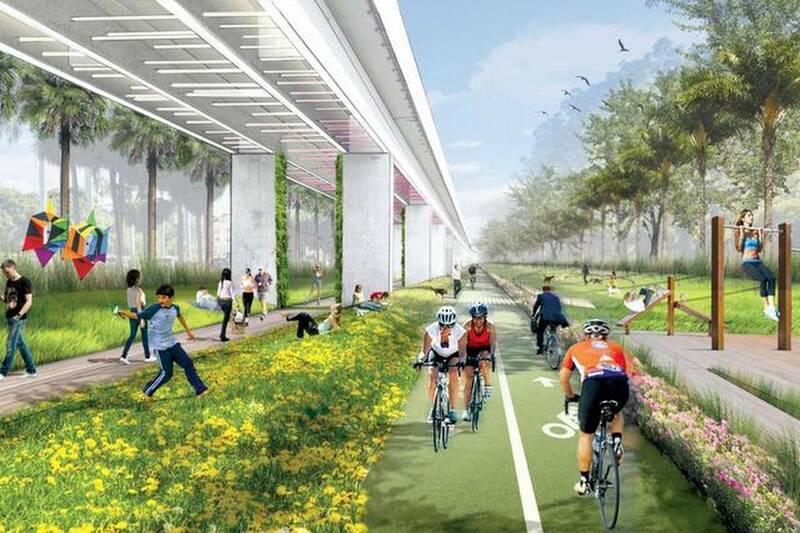 That seems to be the thought with Miami’s proposed Underline project which would transform the 10-mile stretch underneath an elevated Metrorail line into linear park and active transportation corridor. The Underline just released an RFQ for a master plan, so have it all you designer people. This project reminds me of a very pretty version of the Central Valley Greenway in my old hometown of Vancouver which largely follows the path of the elevated SkyTrain from Vancouver to New Westminster. 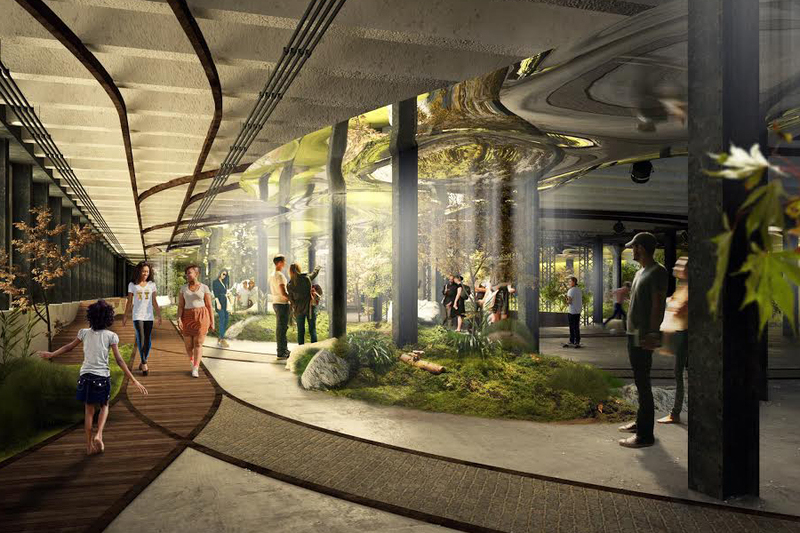 This proposed project would see an old underground trolley terminal in the Lower East Side turned into an underground park by using “remote skylights” to focus sunlight underground and let plants grow (a.k.a. witchcraft). There is something slightly apocalyptic about the whole proposal of a park underground. Even just looking at the renderings gives me a weird combined sense of wonder and dread. But if the world ever ends rendering the surface of our planet unusable, you’ll find me there. Okay, I cheated. It’s not of the X-line nomenclature, but I wanted to include The 606 from Chicago because it follows along the same lines (yuk yuk) as the others. 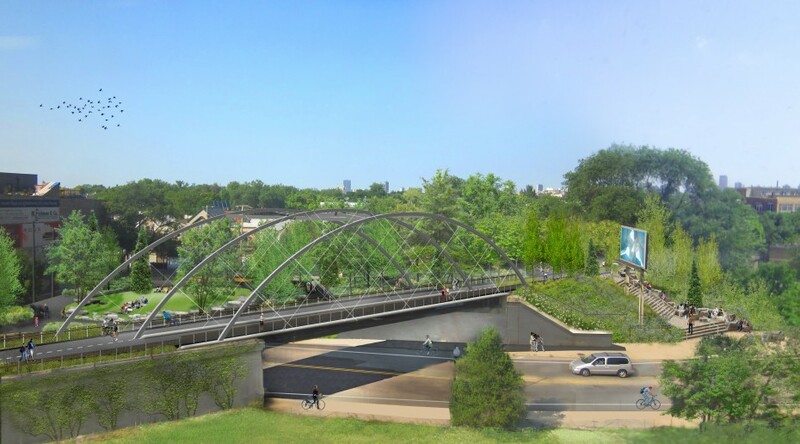 This project is turning the unused elevated Bloomingdale rail line into a linear park with, you guessed, a pedestrian and cycling trail. 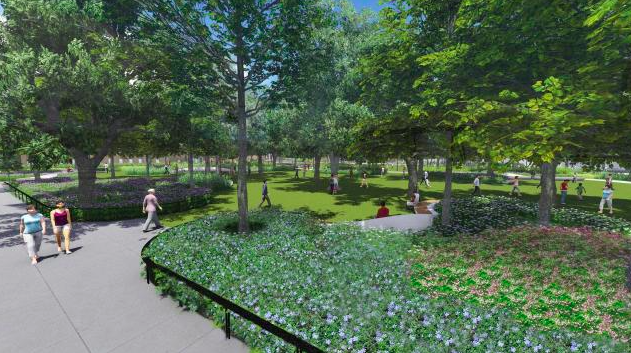 The project, which broke ground in 2013, will connect six neighbourhood parks and serve 80,000 people within a ten minute walk. 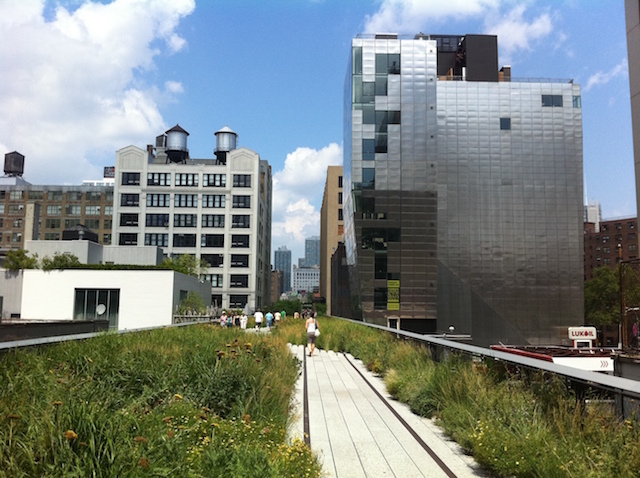 images are taken from the respective project websites, except for the High Line which is my own photo. You know what the original crowdfunding for parks was? Taxes. An article yesterday in Next City explored the growing trend of using crowdfunding tools to raise money for public park and open space projects. Crowdfunded parks are coming and that isn’t a bad thing, the article says. Examples were given where money was crowdfunded for new projects entirely or for publicly funded projects that need a little bit of extra money to top them up. But turning to the ‘crowd’ is not a new source of funding–not really. 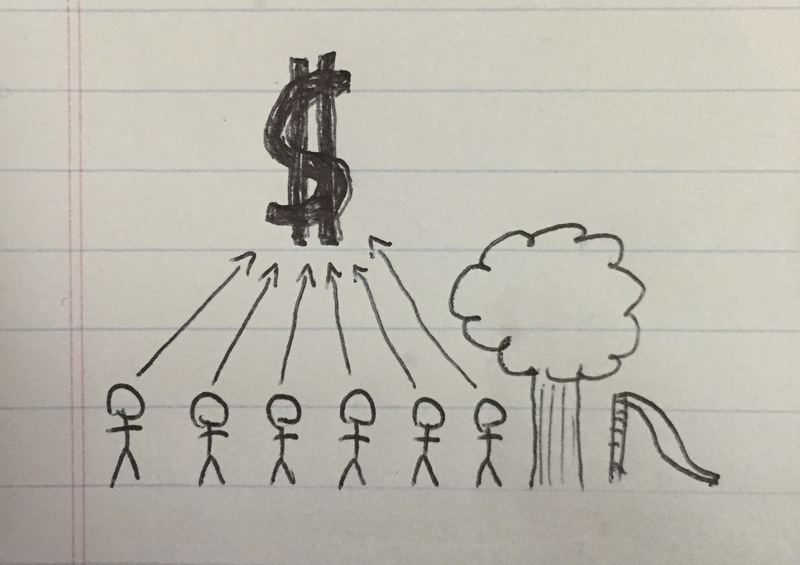 The original crowdfunding is, of course, taxes. The article was meant to be a positive showcase of neat things that citizens and groups are doing to help improve their local parks and open spaces. And they are neat things. I love seeing people engaged in improving their local parks. But the other side of the story is that, for many cities, cuts to park budgets have put a strain on many parks departments, no doubt helping to create this environment where citizens and groups feel they need to step in themselves when funding gaps arise. Perhaps, as former NYC Parks Commissioner Adrian Benepe argues in the article, private fundraising for projects frees up public money to be spent elsewhere, like in underserved communities. It would make an interesting study. Leveraging different sources of funding and creating partnerships with non-profits and community groups to deliver park projects is crucial to the future of our public park system, no doubt. But we cannot lose sight of the fact that a strong public park system requires a strong public budget and that requires leveraging that original crowdfunding tool: taxes. In fact, some places are making progress on this. Seattle just voted to create a park tax district that will help fund park improvements and maintenance for years to come. A suburb in Denver also recently voted for a tax increase for parks. It can happen. A $170 million park island may be coming to New York, largely dreamed up and paid for by one rich guy. Is this good? 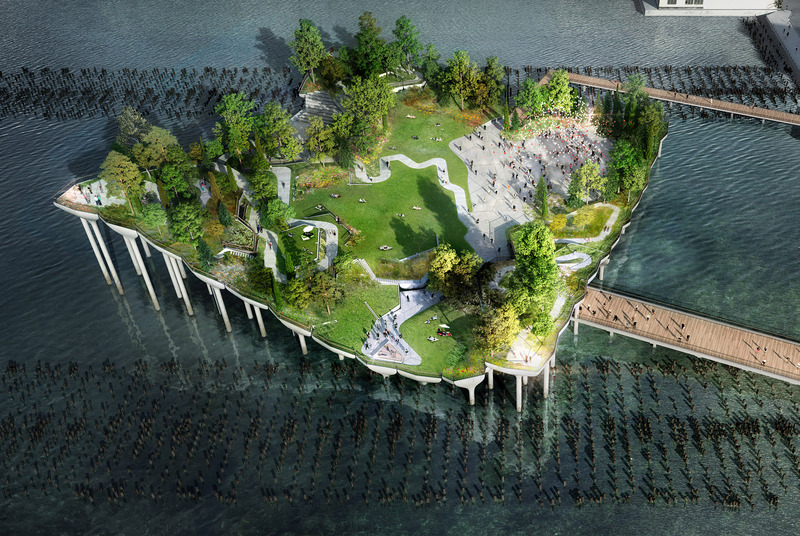 Yesterday I woke up to the above picture of a proposed park island in New York’s Hudson River along with breathless reporting about the very, super, incredibly rich person behind the vision and the money to get it built. The low down: Media mogul Barry Diller will pay a heart-stopping $130 million of the cost of this park island, while the City, State, and Hudson River Park Trust will kick in another $39.5 million. The park will feature performance spaces that, it seems, Diller has already figured out everything for. He has offered to pay for operating costs for 20 years. Diller originally pledged $35 million to help the Hudson River Park Trust revitalize Pier 54, but then he got some big ideas and his commitment became also big. On the one hand, it’s amazing to see such an incredible level of private interest and investment in a public park. But on the other hand, it’s troubling to see such an incredible level of private interest and investment in a public park. I’m not saying private investment in public spaces is bad–it can do a lot of good for cash-strapped city park departments, but it should be grounded within an open public process and local community needs. Diller’s own comment made me cringe a bit. “We are so luck as a family that we get to do this,” he said. It is also interesting to note how this announcement of Diller’s $130 million dollar gift to build a mega-park is almost the perfect mirror image of the $130 million the NYC Parks Department announced a few weeks ago to revitalize 35 community parks in low income neighbourhoods as part of Mayor de Blasio’s new park equity focus. Now it seems de Blasio has even out-Bloomberged Bloomberg with the park island deal. I’m not writing this to be a downer or proclaim that I think that the park island is a bad idea. I don’t know enough about the specifics of the Hudson River Park Trust or the park needs in that area. But we should be critical and ask questions about very large private investments in public space that come from one person who has dramatically shaped the final result without, it seems, much input from the public. It’s easy to get starry eyed from dreamy renderings and jaw-dropping proposals, but once we get a chance to wipe the dazzle from our eyes, we should ask ourselves a few questions. Questions like: How much was the public consulted or not consulted about this idea? How much say did the City have in shaping the proposal? How much say does Diller have in what gets built and how it operates? Will he walk away from the project if changes are proposed? What happens if (when) the cost of the park goes up? Who covers that? How expensive will this be to maintain when Diller’s 20 year operating agreement is up and the infrastructure is old? Who does it serve? Who does it not serve? Then there are other questions like: is it even smart to build a park island when climate change means more superstorms in New York’s future? Just because someone offers to pay for something spectacular doesn’t mean you should do it, or even that it’s a good idea. And it certainly doesn’t mean we should just applaud and say go for it. As Croft said, we have to think long and hard about what it means to have one very rich person dictate the shape of our public spaces largely without community input. Now that it’s out in the public, there will be a debate. And I hope it will be vigorous. There are lots of neat things about the redesign of Toronto’s Grange Park by Phillips Farevaag Smallenberg, from an expanded playground area, to new water features, to more trees. And all those are well documented here on Urban Toronto. Or you can watch the fancy fly-through rendering which contains, inexplicably, a man who appears to be carrying on an animated conversation with a fountain at the 1:10 mark. But I don’t want to talk about all that. I want to talk about edges. Because I’m really, really excited about Grange Park’s new edges. The redesign would remove that fence and build raised gardens with low fences (see title photo) and rippling benches down the Beverley Street frontage instead. Right now, Beverley Street doesn’t really have much relationship to the park–it feels like its backside. The fence is so high that it makes the park feel almost like someone’s private yard (which, in fact, it once was–so there’s that). 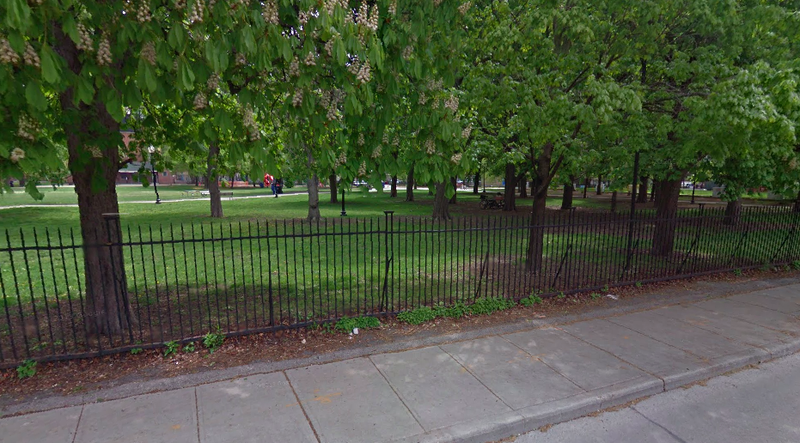 What he was concerned about, I think, was that removing the fence would also remove part of what makes Grange Park feel different or special from the rest of the city. It makes the park less a place to just carelessly cut through because you must consciously enter it. And park edges do need extra consideration because they can quickly become the rattiest parts of the park, especially along long frontages. You often find dead strips of yellow grass or dirt trails where people have overflowed from the sidewalk. Fences help keep people off grassy and sensitive areas and corral people into using predetermined pathways. And too soft an edge where a park meets a busy street can mean people stay farther into the park as a buffer to get away from the traffic. But I think the proposed garden ripples with their raised beds and seating will create a kind of soft, more porous fence for Grange Park that still allows you to feel you have “entered” the park without creating that hard, unfriendly edge that the fence does. A fence or a hard edge can be a part of what makes a good park, too. It depends what kind of message you want to send and how that barrier is designed and interacts with the park and the street. Central Park (above) is surrounded mostly by a low stone wall that solidifies that park’s image as a pastoral green oasis. That stone wall is actually an inviting and important feature of the park, creating a welcoming edge. And I’ve long thought the large park near my apartment, Christie Pits Park, needs some extra treatment along its long Bloor Street frontage other than the current grass-meet-sidewalk situation. It doesn’t have to be elaborate by any means, but I think the park edge would benefit from a bit more definition and interaction with the street and help make that part of the park near the road more inviting. So: edges. Hard and soft, good and bad, depending who you ask, what they are doing, and how they are doing it. Simple, right? I pass by Phoebe Street in downtown Toronto often on my way to work. 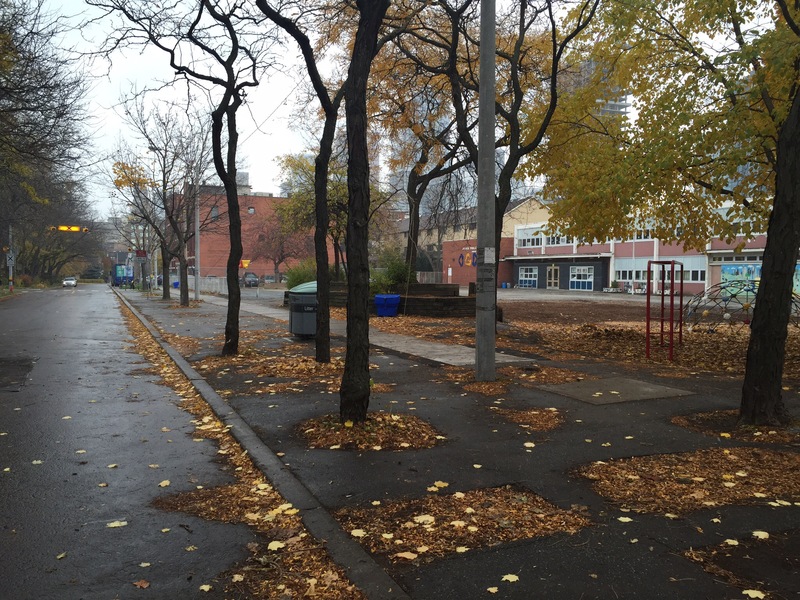 It travels east off of busy Spadina Street and into a calm, quiet residential area with a school. Despite its width there are few cars that travel its length due to a barrier installed to reduce traffic because the school’s playground faces the street. The whole thing seems like a half-done project to me. Why leave all that asphalt there after going through the trouble of basically barricading the street? I can’t help but think of the mini-parks in my old neighbourhood in Vancouver’s West End. There are nine of them now, but the first started in 1973 as a traffic calming initiative. The idea was that a half block of a street would be transformed into a green space with gardens, benches and a pathway to allow pedestrians and cyclists through, but not cars. They are one of my favourite features of the West End, a dense tower neighbourhood with big leafy trees. And I’m not alone. 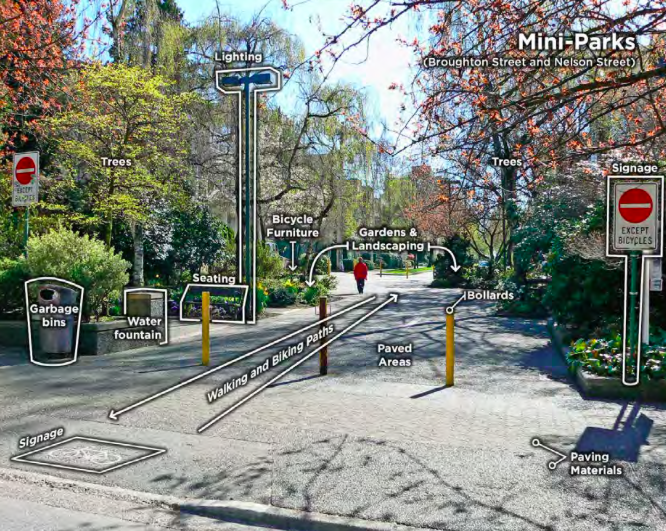 A recent city survey found that the mini-parks were near the top of the list of what people loved about the West End’s streets and that 93% indicated they visited a mini-park several times per week. The area of Toronto where Phoebe Street is has some of the lowest levels of parkland in the city relative to population and is just north of an area City staff recently said needed new parkland. Not only that, but it would benefit the nearby schoolyard by increasing green space and could actually create a green corridor to help link Spadina through to Grange Park. So let’s finish what we started and use Vancouver’s mini-parks as a model to turn this part of the street into a park.